Director of National Intelligence James Clapper expressed "huge concern" Wednesday that Islamic State militants might infiltrate crowds of Syrian refugees fleeing to the West and thereby enter Europe or the United States. 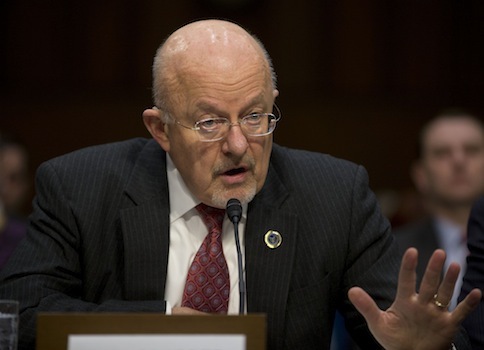 The Washington Times reported that Clapper pointed to IS (also known as ISIL or ISIS) gaining access to Western countries as an "obvious issue" with the thousands of Syrian war refugees flooding to Europe and the U.S. in order to escape the chaos in the Middle East. "As they descend on Europe, one of the obvious issues that we worry about, and in turn as we bring refugees into this country, is exactly what’s their background?" Clapper said during remarks at an annual U.S. intelligence community conference in Washington, D.C. He deemed the possibility a "huge concern" among officials in the intelligence community as Western countries endure increasing pressure to accept Syrian refugees amid the Syrian civil war. The United States has allowed in under 2,000 Syrian refugees. While Clapper on Wednesday lauded the "pretty aggressive" means by which U.S. authorities screen refugees attempting to enter the country, he added that he does not have as much faith in the systems set up by European nations. Approximately 4.1 million refugees are fleeing from Syria to avoid the conflict in the country. European countries have received hundreds of thousands of asylum requests from Syrian refugees amid the civil war, and the wave of refugees to the region has intensified in recent months. The Washington Free Beacon reported Thursday that al Qaeda, which has suggested cooperation with the Islamic State, is dispersing training manuals calling for "long wolf" attacks on America ahead of the 9/11 anniversary. This entry was posted in National Security and tagged Bashar al-Assad, James Clapper, Syria, Terrorism. Bookmark the permalink.